The seed for this recipe was sown by Chris after he asked me when I was going to make ravioli using Mongongo nuts. Once again we’re laden with pounds and pounds of nuts, harvested from our house tree in June, shelled by Ruth Mongongo in her village on the Zambezi River, and safely stored away in our big freezer. Having purchased 10 point-of-lay hens back in June — fulfilling a lifelong wish to have my own chickens — our busy ladies are now producing 10 eggs a day. 10 out of 10! The joy this gives me! The eggs are growing in size; the yolks becoming ever more yellow. There is no longer any excuse for us not to make fresh pasta. Mix together the basil, Mongongo nut meal, cheeses and garlic, and bind together with the egg. Set aside. Sieve the flour into a large mixing bowl, and make a hole in which to pour the beaten eggs. Combine with a wooden spoon until the mixture starts sticking together and turning into a crumbly dough. Turn the dough out onto a flat surface and knead until it is well bound and changes color, about 15 minutes. (You will ‘feel’ the dough change as you knead; it starts to sweat as it becomes softer and more malleable.) 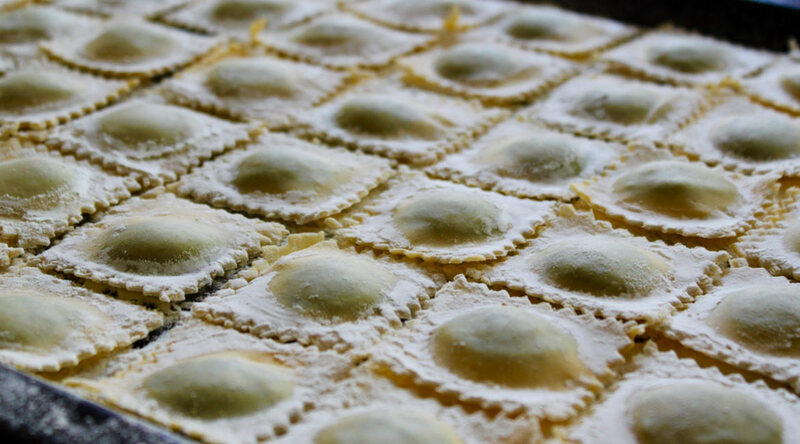 Cover the ball of dough with a damp tea towel so it doesn’t dry out during the process of rolling the ravioli sheets. Clean the pasta maker by running a small piece of dough through the rollers 3-4 times. Discard the dough. Break off a handful of pasta dough and run it through the pasta maker at its thickest setting about 3-4 times. When the pasta sheet feels smooth and sturdy to the touch, run it through each subsequent setting until it’s at its thinnest. Carefully place one end of the pasta sheet over the ravioli tray, folding the rest under a damp tea towel until ready to use. Press down gently on the ravioli squares with a rolling pin to seal them. Remove the excess dough from the sides of the tray, and then transfer each ravioli square to a floured baking tray. Repeat these steps until all the dough and filling have been used up. Refrigerate or freeze the ravioli until ready to use (I aways freeze mine overnight). Bring a pot of salted water to a roiling boil. Carefully spoon in the ravioli squares and cook, about 4-5 minutes. While the ravioli is cooking, melt the butter in a small saucepan. When the butter starts to froth and turn brown, remove from the heat immediately. (Watch it carefully because butter can burn every easily.) Stir the Mongongo nuts, fresh herbs, and lemon juice into the brown butter, or beurre noisette. Lay out the ravioli neatly on a plate, spoon over the lemon-infused beurre noisette, sprinkle with grated parmesan, and serve immediately. Basil & Mongongo Nut Ravioli with Lemon-infused Beurre Noisette. Thank you, chitaitai … yes, they make a great alternative to pine nuts. We can seldom buy pine nuts here at all! Oh yummy! Have you seen these nuts on sale in zim, and if so what’s their Shona name? Thanks for your interest, as always, Shaunagh. A Mongongo tree in Zimbabwe is referred to as a Manketi tree (common name). They grow on Kalahari sand so will probably only be found in the Zambezi Valley/ Vic Falls area. That said, it would be worth asking around, maybe in the Harare markets. Good luck! Gorgeous photos! I am so fascinated by your Mongongo nuts. And isn’t it fun having chickens? We’ve had lots and lots at times (don’t try making money from it … it doesn’t work). Now we’re down to just two. But they’re such fun creatures and the eggs can’t be beat. Thank you so much, Michelle. Ah yes, the joy of chickens! I’m in love with all 10 of them … and, as you say, there is little that beats a good fresh egg. We are indeed fortunate to live under a Mongongo tree, although when I first arrived on the farm not many people I met had ever eaten the nuts. I’m trying to remember if there are any native nuts in your neck of the woods, or Virginia for that matter? Looks so delicious! Love all the eggs! How wonderful to be so well supplied with nuts, eggs and basil! And what a delicious way to use them. Maybe I can adapt this for walnuts if the squirrels leave us any on the tree in autumn. Great idea, Anne! I’ve found walnuts go really well with rocket, or any of the spicier greens. I’ll keep an eye out on your blog! Your ravioli looks absolutely scrumptious with your pesto. Would love to try a Mongongo nut. How big are they? Do they have a shell? I often use walnuts in place of pine nuts which are very pricey. These are stunning ravioli! But I so wish I could taste some mongongo nuts!! !